Shopping for Transformers Phone Accessories? Keep your phone secure while playing games and stand it at a comfortable angle while watching videos with this versatile Transformers The Last Knight Decepticon Phone Ring Grip and Stand. 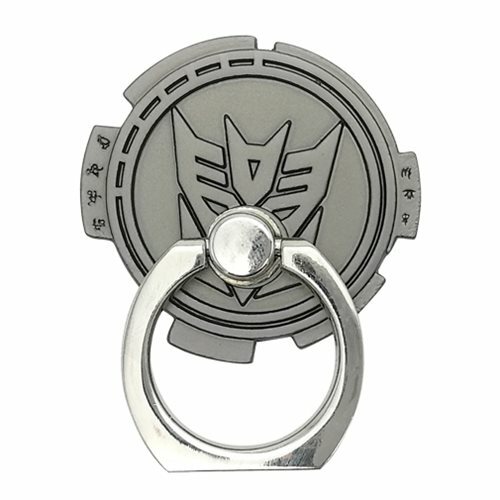 Featuring the logo of the Decepticons as seen in Transformers The Last Knight, this Ring Grip slips around your finger, allowing you to safely use your phone while relieving pressure on your hands. If you want to watch a video in comfort, use it at a phone stand by using the multi-purpose ring. This grip ring is 2-inches tall x 2-inches wide.